Published February 5, 2017 By Anna T. This post may contain affiliate links. Regardless, I only recommend sites I've researched and/or used and trust. Are you looking for legit work from home jobs? If so, you are in luck! Today, I've published a HUGE list of 111 opportunities to consider. Many (but not all) of these companies are accepting applications currently, so you can start applying right away and hopefully get hired soon. I also want to take a minute and remind you that this blog shares updated job leads several days per week. And if you're a newsletter subscriber, you will get those job leads in your inbox! Apple – Read Apple Chat review – US. Apple hires remote “advisors” to help with customer and tech support from home. The pay is good (typically in the teens) and they will also send you a Mac to use to do the work from. Currently this position appears to be open to college students only. Operator – Read Operator review – Hires people to help their clients make shopping decisions via their mobile phones. May need to have at minimum a bachelor's degree to be considered for the position. The Chat Shop – Read The Chat Shop Review – Hires people worldwide to handle chats from home for various businesses. May pay between $9 and $10 hourly. Ginger.io – Read Ginger.io Review – This company hires licensed psychiatrists, therapists, and mental health coaches to help their customers via live chat or video sessions. Pay is $17+ hourly. Shipt – Read Shipt Review – US only, specific locations. Earn money shopping for, and delivering groceries to people in your area. Amazon Flex – Read Amazon Flex Review – US only, specific locations. Deliver packages for Amazon Flex and earn $18 to $25 hourly. DoorDash – Read DoorDash Review – US only. Earn up to $25 an hour delivering food orders to people. Keep 100% of your tips and set your own schedule. Postmates – Read Postmates Review – US only, specific locations. Become a personal shopper/food delivery driver for Postmates. The company claims up to $25 hourly working on your own schedule is possible. Cambly – Read Cambly Review – Possibly open worldwide. Earn money video chatting with non-English speakers to help them learn conversational English. Earn .17 cents per minute of chatting time. Payments are made weekly. SayABC – Read SayABC review – Earn up to $21 hourly as a SayABC English teacher. You are free to set your own hours. Must be a native English speaker with a bachelor's degree or proof you are a final year student, and some past teaching experience. QKids – Read QKids Review – Earn $16 to $20 hourly teaching English online for Qkids. Open in the US and Canada to people with a degree or currently enrolled in a university program. Englishunt – Read Englishunt Review – US only. Remote jobs tutoring non-English speakers in English. You must have teaching or substitute teaching certification as well as a 4-year college degree. iTalki – Read iTalki Review – Open worldwide. Set your own prices and earn extra money teaching ESL on iTalki. Learnlight – Read Learnlight Review – Open worldwide. Teach foreign languages from anywhere. This company was formerly known as ISUS. Experience and a foreign language teaching qualification are required. Rosetta Stone – Read Rosetta Stone Review – US only, specific locations. Work-at-home jobs as a language tutor for a very well-known company. This is an employee position with benefits. VIPKid – Read VIPKid Review – US and Canada only. Legit home-based jobs tutoring Chinese children in English language and content. Pays $14 to $18 hourly with a flexible schedule. See more ways to teach English online. Crisp Thinking – Read Crisp Thinking review – Open to US and UK. Work from home jobs as an independent contractor, providing moderation and community management services to Crisp Thinking's clients. Earnings may be between $10 and $15 hourly. ICUC – Read ICUC Moderation review – Open worldwide. You need to be able to work in English and also another language to qualify as a community manger or social media moderator for ICUC. You may earn between $10 and $18 hourly depending on your experience. Metaverse – Read Metaverse review – Open worldwide. Virtual work providing community support/moderation services to Metaverse's clients. They have different jobs posted on their site at different times. Flexible scheduling. The Social Element – Read The Social Element review – Open worldwide. Work-at-home as an engagement specialist or moderator for many well-known clients via The Social Element (formerly known as eModeration). See more work at home moderation jobs. ARC Consulting – Read ARC Consulting review – Open to US and some other countries. They have a lot of phone mystery shoppers, which is ideal if you would prefer not to leave your home to do mystery shopping. GAPbuster – Read GAPbuster review – US and possibly other countries. They are regularly looking for people with internet access who are reliable and observant to do mystery shops for them. Second to None – Read Second to None review – Open to US and Canada. Sign up and gain access to their national job board of mystery shopping assignments. See more mystery shopping companies. Konsus – Read Konsus review – Open worldwide. Lots of different types of work available, including writing, data entry, research, and more. Pays monthly and only two percent of applicants are accepted. OneSpace – Read OneSpace review – Open worldwide. This network for freelancers was formerly known as CrowdSource. They have all sorts of short task work available including image tagging, website categorization, transcription, writing, and editing. Upwork – Read Upwork review – Open worldwide. Easily the most popular freelance network, formerly known as oDesk. You have to complete your worker profile, seek out remote jobs that interest you, and then bid on them. Be careful because not all jobs listed on Upwork are legit. Rover – Read Rover review – This is a service that allows dog owners to connect with professional pet sitters. If you are looking to start doing pet sitting to earn additional, or even full-time, income, Rover might be a way to get going with that. If Rover approves your profile, you'll be listed in their database of pet sitters. You keep 80% of the earnings from the jobs you land through Rover. See more pet sitting companies. ABC Financial – Read ABC Financial review – Open to US, specific states. Legit jobs providing customer service to people who have billing questions regarding gym/health center memberships. May pay around $11 hourly. Pull up “remote” under the location drop down box on their jobs page to find the remote openings. Alchemic Dream – Read Alchemic Dream review – Open worldwide. This company hires virtual customer support agents for the gaming industry. In addition, they have other types of positions that are home-based available as well, including community support positions. Alorica – Read Alorica review – US only. Employee position offering some benefits. Most agents earn between $8.50 and $9 hourly. This company was formerly known as West at Home. Amazon – Read Amazon work from home review – US only, varying states. Amazon often has seasonal virtual jobs. These are customer service positions open to different states. I most often see these around the holidays. Pay is typically $10 or more with opportunities for bonuses. Answer First – Read Answer First review – Florida. Legit work from home providing customer service to Answer First's clients. Training is paid, interview takes place in-office. Capital One – Read Capital One review – US only, typically limited to specific cities and/or states. This is an employee position that typically asks for at least 2 years of past customer service experience. Per Glassdoor, reps earn around $27K per year. 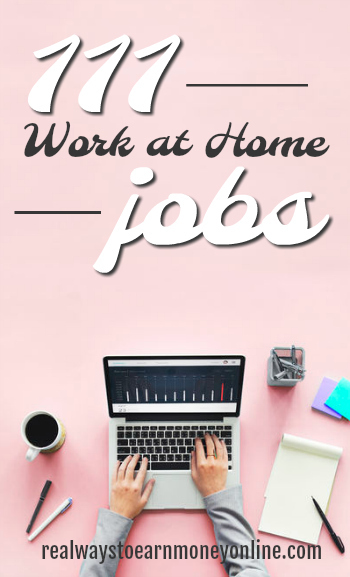 You will have to type “work at home” in the keyword box on the jobs page to see what home-based positions are available currently. Carnival Cruise Lines – Read Carnival Cruise Lines review – US only, often limited to just Florida. This company occasionally has work at home reservation rep openings. In most cases, you work out of the main office for a while prior to working from home. The position is not always listed, so you'll just have to look under their customer service category on the jobs page for their website to see if there are home-based openings. Concentrix – Read Concentrix review – US. Employee positions. Work in the Concentrix virtual contact center and earn $9.50 hourly. There are no fees to start. Cruise.com – Read Cruise.com – US only, various states. This a home-based job allowing you to provide customer service to Cruise.com's customers via phone. Pay may be between $10 and $15 hourly and training is paid. Doctor on Demand – Read Doctor on Demand review – US, local or near to Austin, TX. Work remotely providing support to members and physicians. Starts out as an in-office job, but you will gradually move over to working from home. Hilton Worldwide – Read Hilton Work at Home Jobs Review – US only, locations may vary. Employee position with benefits packages and year-round work. May pay between $12 and $15 hourly. Intuit – Read Intuit review – US and occasionally Canada. Work at home tax support openings are often available. This is phone work. Pay rate not listed, but I have seen some old job postings stating that it is in the teens. Kelly Services – Read Kelly Services review – US only. Work at home jobs providing customer service to Kelly's clients. This is more of a staffing agency because they work with many well-known companies that use Kelly to find workers. LiveOps – Read LiveOps review – US only. This is independent contractor work and pay is per minute of talk time. Of all the remote phone jobs out there, this one some of the most flexible scheduling. Neiman-Marcus – Read Neiman-Marcus review – US only, specific locations. A well-known retailer with occasional remote phone-based customer service work. It's an employee position offering paid training, and your pay rate once you start working may be between $11 and $16 hourly. Sykes – Read Sykes review – US only. They hire work at home customer service reps in many areas nationwide to aid their clients. Full or part-time positions available. This is also an employee job offering some benefits. Transcom – Read Transcom review – Formerly known as Cloud 10. They handle different types of calls for clients, including customer service, sales, and tech support. Williams-Sonoma – Read Williams-Sonoma review – US only, specific locations. Work from home jobs providing customer service to Williams-Sonoma customers. Paid training with $11+ hourly. You'll have to type “work at home” or “work from home” in the keyword box on the company's careers page to see when this listing is available. Working Solutions – Read Working Solutions review – US only. Provides customer service, but also occasionally sales and tech support services for their clients. Earn between $9 and $30 hourly, depending on the program. Independent contractor position. XACT Telesolutions – Read XACT Telesolutions review – US only, varying states. You work at home handling inbound calls, chats, and emails for XACT's clients. Pay is advertised to start at $9 hourly, but could go up to as much as $15. See more work at home customer service jobs. Brighten Communications – Read Brighten Communications review – US only. Virtual work doing lead generation, appointment setting, and other sales related calls from home. Pay is weekly, either hourly or commission depending on which is greatest. I Dial U – Read I Dial U review – US only. Commission-based phone work from home jobs with required weekly quotas to meet. The work involves lead generation for automotive and mortgage companies. Institute of Reading Development – Read Institute of Reading Development review – US only. Work at home jobs as a sales/enrollment coordinator for this company. It's an independent contractor position with paid training. Your earnings will depend on performance. Paragon Planners – Read Paragon Planners review – US, specific states. Legit work from home doing scheduling and appointment setting for this company as an employee. Work up to 35 hours per week. Welcome Wagon – Read Welcome Wagon review – US only, various states. Earn money welcoming people to new neighborhoods and introducing them to various local services. You work on commission. 2U – Read 2U review – US only. This company always has lots of jobs listed, but if you browse the open positions, you'll see some that say “remote.” These are typically technical support jobs. On the job postings, it states that they prefer applicants with bachelor's degrees. Teleperformance – Read Teleperformance review – US only. This company hires for virtual tech support in the US. It's an employee position with paid training and some benefits. Aira – Read Aira review – This is a way to help the blind and visually impaired complete everyday tasks and also get paid. You must be a US resident and you will work as an independent contractor. Pay is rumored to be around $15 hourly. Causeworx – Read Causeworx review – Canada and US. Most often they only hire Canadian residents, but there is an occasional need for US-based workers. The work involves tele-fundraising, calling on behalf of various Canadian non-profits. While this is cold calling, you are contacting people who have already opted in to be called. Contract work paying around $11 and $14 hourly plus incentives, in Canadian dollars. MaritzCX – Read MaritzCX review – US only. Work at home as a market research interviewer for MaritzCX. The pay starts out at minimum wage with potential for increases after 30 days. Yardi Matrix – Read Yardi Matrix review – US only. Phone mystery shopping paying around minimum wage. Employee position and seasonal. No experience is required to start these work from home jobs, though you do have to take a test. iSoftStone – Read iSoftStone review – Open worldwide. Work from home jobs doing short tasks and evaluating internet search results for a better searching experience. Independent contractor work with a minimum of 10 hours per week required. Lionbridge – Read Lionbridge review – Open worldwide. Work at home jobs doing search engine evaluation and other types of short tasks for this company. Lots of non-phone work. KarmaHub – Read KarmaHub review – A newer company, but my readers have said they are paying. You have to email them to get information on jobs. Their email address is located at the bottom of their homepage. See more search engine evaluation jobs. Amazon FBA – Read Amazon FBA review – A way to earn money selling stuff on Amazon. Similar to eBay because many people “flip” things they find at the thrift store or at discounted prices. However, the difference is that this way, Amazon handles all the shipping and dealing with customers for you. You just source the items, pack them, and ship them off to Amazon, and they handle the rest. Amazon Handmade – Read Amazon Handmade review – Amazon's answer to Etsy. If you have crafts to sell online, this is something to use instead of, or in addition to Etsy to help maximize your profits. eBay – Read eBay review – Open worldwide. Most people are familiar with eBay, considering how long it's been one of the most popular ways to sell your stuff online. It remains as popular as ever, and it's still a great work at home option if you can learn to get it to work for you. Teespring – Read Teespring review – Sign up and begin designing T-shirts using their user-friendly system. There is no guarantee your shirts will be made and sold, you must get a certain amount of interest before that happens. See more ways to sell your stuff online. 3 Play Media – Read 3 Play Media review – US only. Must have college degree. This is more transcript editing than actual transcription. It is an independent contractor position. Allegis – Read Allegis Transcription review – US only. Work from home doing insurance transcription for Allegis. A minimum of 2 years of past transcription experience is required. Babbletype – Read Babbletype review – Must be a native English speaker. Work from home jobs doing different types of transcription work for Babbletype's clients. Payments are made weekly via Paypal. CastingWords – Read CastingWords review – US only. Work at home doing short transcription tasks for CastingWords. Payments are made via Paypal. Flexible work, allowing you to work anytime provided they have tasks available for you to complete. CrowdSurf – Read CrowdSurf review – Sign up for CrowdSurf via the Work Market platform and earn money doing short transcription tasks. No prior experience is necessary and your schedule is flexible. May just be part-time income. Daily Transcription – Read Daily Transcription review – US and Canada. This company provides transcription services to the entertainment, corporate, and legal industries. They hire transcribers to work at home on an as-needed basis. Landmark Associates – Read Landmark Associates review – Open to North American applicants only. This company looks for experienced transcribers, and a skills test must be completed before you're hired. The company claims to pay twice monthly via direct deposit. Literably – Read Literably review – Open worldwide. Work from home transcribing grade school students reading aloud. It's possible to earn $10 or more hourly once you build up speed and learn what you're doing. Net Transcripts – Read Net Transcripts review – US only. Work at home doing law enforcement transcription. Pay is made monthly and some past experience may be required depending on the position. Quicktate – Read Quicktate review – Open worldwide, though you must have a tax identification number to apply no matter where you live. A background check is also done. This company has been around for a long time and they are also very beginner-friendly. Transcribe.com – Read Transcribe.com review – US only. Work at home as a transcriber for this company and get paid daily to Paypal. Beginners are welcome, but you must pass their assessment before you're considered. Way With Words – Read Way With Words review – Open worldwide. Work from home doing transcription for Way With Words. They may up to $57 per audio hour. Note this is not the same as a regular hour, considering that one hour of audio can take you 2-3 hours to complete. They prefer people with experience. See more work at home transcription jobs. Telelanguage – Read Telelanguage review – Appears to be US only. Employee positions. In addition to hiring for translation/interpretation, this company also has transcription openings available on occasion. VerbalizeIt – Read VerbalizeIt review – Possibly open worldwide. Work from home jobs doing freelance translation as an independent contractor for this company. Get paid every 15 days for your accepted work. See more work from home translator jobs. Measurement, Inc. – Read Measurement, Inc. review – US only. Regularly hiring remote scorers to read/evaluate essays, open-ended questions, and more. It's project-based, temporary work requiring a bachelor's degree. Flexible schedule. PrepNow – Read PrepNow review – US only. This company hires people to work at home jobs tutoring students for tests like the SAT, ACT, and PSAT. You must have at least two years of past teaching or tutoring experience as well as either a composite 28 on the ACT or a 650 on the SAT Math and SAT Verbal/CR. A bachelor's degree from a 4-year accredited school is also required. Tutor.com – Read Tutor.com review – US and Canada. Work at home tutoring students online. Flexible schedule. Earn between $9 and $13 hourly. See more online tutoring jobs and work at home test scoring jobs. Belay Solutions – Read Belay Solutions review – US only. This company was formerly known as EA Help. They hire US-based virtual assistant to work at home assisting their clients. It's a contract position requiring experience, and a bachelor's degree is preferred. Rate of pay is not listed, but some people are may consider it a part-time income. Contemporary VA – Read Contemporary VA review – Open worldwide. Not always hiring. Work as an independent contractor offering your skills to the company's clients. Pay may be around $10 hourly. Okay Relax – Read Okay Relax review – May be open worldwide to people fluent in English. The company will assign you clients to perform tasks for. You must have at least a bachelor's degree to qualify. Time Etc. – Read Time Etc. review – Open to US and UK. Work as a virtual assistant from home for Time Etc. as a freelancer. They require at least 2-3 years of relevant experience. Pay is monthly via Paypal, and pay may be between $11 and $16 hourly. Worldwide101 – Read Worldwide101 review – Open to US and UK. Work from home jobs doing administrative tasks for Worldwide101's clients. Pay may be between $15 and $20 hourly. See more virtual assistant jobs. UserTesting – Read UserTesting review – Open worldwide, but you must be able to get paid via Paypal. Earn $10 per successful test. Tests are available on a first come, first serve basis. Enroll – Read Enroll review – Possibly open worldwide. Sign up and take short little usability tests when they are available. Definitely just an extra cash opportunity. ErliBird – Read ErliBird review – Open worldwide. Earn money for beta testing new apps, websites, and occasionally gadgets. Payments are made via Paypal and cash rewards vary, but typically do not go above $10. Testbirds – Read Testbirds review – Open worldwide. Earn money in your spare time testing out new software for this company. See more usability testing companies. BKA Content – Read BKA Content review – US only. Must commit to writing 10-15 articles per week. Work whenever you want. They require all writers be at college-level with their writing abilities. Constant Content – Read Constant Content review – Open worldwide. This is an article marketplace that allows you to create articles on any topic and then list them for sale, setting your own rates. CopyPress – Read CopyPress review – Open to US, Canada, Australia, and England. Work from home doing large-scale writing projects for a variety of different industries. Pay varies depending on the project. Online Writing Jobs – Read Online Writing Jobs review – Open to US only. Work on writing projects and earn between $10 and $27 per project. Pay is on the low side. Payouts are made weekly via Paypal. SmartBrief – Read SmartBrief review – US only. This company regularly seeks out freelance news writers to create short, newsy articles. This is also shift-based work, which is a bit unusual for freelance writing jobs. Talent, Inc. – Read Talent, Inc. review – Possibly open worldwide. Get paid to work at home, writing resumes for Talent, Inc. clients. They pay twice monthly via Paypal, and it's an independent contractor position. WordGigs – Read WordGigs review – US only. This is a content site that uses freelance writers to create content for their clients. Pay is on the low side. See more places that pay you to write. Airbnb – Read Airbnb review – Open worldwide. List your home as a rental and earn money. Not really a “job,” but depending on how attractive your home and location are, you could do well here. AskWonder – Read AskWonder review – Open worldwide. This company offers work from home jobs doing research on various topics and put together the answers in summary form. Flexible schedule. Flexible schedule, independent contractor work. The company claims some people earn up to $2K per month doing this. They always appear to be hiring, although many people do not make it in when they apply. Shutterstock – Read Shutterstock review – Usually US only, but there may occasionally be positions open for other parts of the world. You work at home reviewing stock images and/or vectors submitted by Shutterstock's community of contributors. You are paid per piece. StitchFix – Read StitchFix Stylist review – US only, specific locations. Work at home as a personal shopper and curate clothing subscription boxes. Earn around $15 hourly. Vayable – Read Vayable review – Open worldwide. Earn money as an “insider” introducing people to your city. You can work as much or little as you want. This could be supplemental income or a way to build up a business. Vericant – Read Vericant review – Open worldwide, though preference is given to applicants based in North America. This company hires you to listen to Chinese-speaking students speak English in videos and then rate them accordingly. Voices.com – Read Voices.com review – Open worldwide. Sign up as a voice over artist and begin applying to posted jobs. The amount you earn varies greatly. It is dependent on many factors, including the length of the audio you're recording, your experience, etc. If you've enjoyed this list of legit work from home jobs and are eager to find more, try a subscription to FlexJobs! This is a site I've been using personally for over two years now. FlexJobs posts work at home and flexible job leads five days per week, and they guarantee them all to be legit! Also, their site organization is fantastic. They have almost every job category you can think of covered, making it super simple to find the jobs you're best suited for. You can go here to try a membership. It's a small fee of $14.95 a month, but you can set your account up so you are not billed again after the first month if you're just looking to try it out and see what's there. No worries at all about recurring payments you can't control. Use promo code AFFILPROMO to get 30 percent off your membership! Good luck to you! Please comment below with the work from home jobs you are familiar with to help give everyone other options. Awesome work Anna! I wanted to comment that, when a person signs up with FlexJobs, they get free skills training through ExpertRating.Companies working with FJ do look at skill ratings in a person’s profile. So it’s nice if someone has learned a skill but doesn’t have a certificate or diploma to show for it (some of us do well learning on the fly from books or workshops). CAVEAT – this was true when I was with them 1-2 years ago. Hope that hasn’t changed. And to brush up on skills or learn new ones, folks based here in the U.S. should also check training provided through their public library system. In Maryland, Lynda.com courses are free to library card holders when they access it through their county’s library website. I’m definitely sharing this list. Thanks so much! Thanks for mentioning Worldwide101 Anna! OUTSTANDING! Thank you so very much Anna! Thanks, Anna! You’ve outdone yourself this time – great list. This is awesome Anna. Thanks for putting this together. You know I’m passing this along. Have a great new week! Thought I’d share, I am in the assessment process with Net Transcript, it’s very lengthy and time consuming, (Just warning ya!) and you have to pay for the background check. i think it was around $50. What an amazing list! Thank you for sharing. Your hard work will change many lives, I am sure. Now that a real list!